Ain Sifni (Classical Syriac: ܥܝܢ ܣܦܢܐ, Arabic: عين سفني‎, Kurdish: ‘Eyn Sifnî, also called Shekhan) is an Chaldean village. 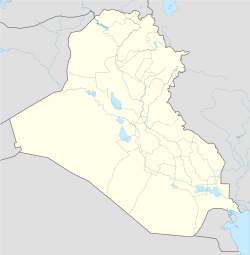 It is also one of the primary holy towns of the Yazidis and the seat of the Shekhan District in the Ninawa province in Iraq. The town is mainly populated by Kurds (Muslims and Yazidis), and a small minority of Chaldeans. The Kurdish dialect of Kurmanji, along with Arabic and Neo-Aramaic are spoken in the town. Prior to the Kurdistan, the town was the second largest population center of the Yezidi Kurds. Beginning on August 10, 2014, Yazidi refugees have been fleeing to the town and Lalish from Sinjar through Syria after the Islamic State of Iraq and the Levant placed that city under siege. The name of the town comes from Aramaic, the language spoken by the native people of the town, the Chaldeans. Its name comes from the words "ea na," meaning "[water] spring," and "sapanna," meaning "sailor." The name of the town means "[water] spring of the sailor." ↑ "Basic information about Shekhan District" (PDF). Christian Aid Program in Iraq. Archived from the original (PDF) on April 25, 2012. Retrieved October 7, 2014. ↑ "What you did not know about Iraq's Yazidi minority". Al Arabiya News. Al Arabiya Network. Al Arabiya Institute for Studies. August 11, 2014. Retrieved October 7, 2014. ↑ "Iraq crisis: the last stand of the Yazidis against Islamic State". The Telegraph. August 12, 2014. Retrieved August 14, 2014. ↑ Soguel, Dominique (August 12, 2014). "World Middle East A sanctuary for Iraqi Yazidis – and a plea for Obama's intervention". The Christian Science Monitor. Retrieved August 13, 2014. ↑ Spencer, Richard (August 13, 2014). "Iraq dispatch: terrified Yazidi people seek refuge inside holy temple". The Telegraph. Telegraph Media Group Limited. Retrieved August 13, 2014. This page was last modified on 7 August 2015, at 11:14.